The Internet doesn't have any services that can take care of your chat logs! 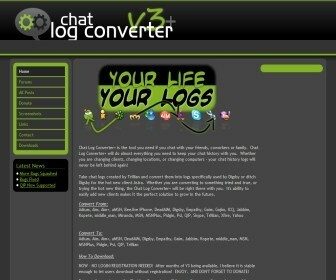 Introducing... Log2Log Chat Log Converter and Loguntu Online Storage! As of this post, wherever you look, even on Google, you probably can't find anything that will convert the chat logs that you want to convert. You: "Is it possible to import pidgin chat logs to empathy? If so, how?" Us: "Actually, yes. Here you go. Bad example. :\"
You: "Is it possible to make my skype chat logs readable? If so, how?" Us: "Today, nah. To make that possible, we are in the process of making Log2Log, a program that can read and save your Skype chat logs into something readable." You: "Is it possible to download a copy of my chat logs from gmail? If so, how?" Us: "Oh no! You can't, at least not in an easy way. The Internet is missing something that people are looking for. Deltik has founded the Log2Log project to allow you to get chat logs that you previously thought were locked in the grasp of someone else." You: "Is it possible to keep my chat logs synced with me everywhere I go?" Us: "Nope. Good idea, though. We're going to make Loguntu, a system that will allow you to store chat logs in one central location that's convenient for you." Google won't let you download your chat logs you stored while chatting on gChat. Using Log2Log, you can securely sign in to Gmail and download your gChat logs without ever giving your password nor data to anyone, not even Deltik. Meebo is a meanie and refuses to create a feature to let you download your chat logs. Log2Log can hop on Meebo and gather all your logs without ever leaking your personal information to anyone. Skype is a weirdo and stores chat logs in some inefficient and freakish way. Log2Log can read it all, and reassemble the logs so that they can be compatible with all the other IM clients. That's not all. I personally use two IM clients, Pidgin and Meebo. It would be a pain to have to run Log2Log often to copy my new conversations from Meebo to Pidgin. Loguntu aims to become the first online storage system for chat logs. The chat logs get stored in one central place that you choose. All the file storage services I know sync files to their own servers, like Dropbox or Ubuntu One. Loguntu will support a variety of locations, so you can choose where to store things. Dropbox, Ubuntu One, Box.net, Windows Live SkyDrive, and more — Ain't nothin' like an old-fashioned simple storage method. FTP — Have you got an FTP server? FTP is easy for Loguntu and you! SSH — If you're really fancy and have an SSH server, Loguntu can handle that too. 750 Words — This wouldn't be the wisest choice, but hey, storing chat logs isn't against Buster's terms of service, and there is no clear limitation on his free text storage service. Yahoo! Mail, Gmail, GMX — Hey, you know your email provider offers you a lot of storage. Idea? Loguntu — Deltik may even host your chat logs for you! We may be able to offer you some space for free, but we also know that many of you have a grand history. For a low monthly fee, Deltik can host your files with extra storage and features. I'm still not done. Why specialize Loguntu for chat logs only? You should be able to store normal files, too! When Loguntu has fulfulled its purpose as chat log storage, file storage wherever you want would be a cool feature. Okay, last thing. Loguntu should team up with Log2Log and synchronize your chat logs! This here is a major challenge. Let's say you have some meetings on Skype, then chat with some friends on Gmail, and you pull up Adium on your Mac for a few days. Using Log2Log by Loguntu, your chat logs can be kept up-to-date with all your clients (if possible) by using the Log2Log Standard Chat Log Format. When Can I Get All This Awesomeness??? Okay, so this is completely new territory for Deltik—so new that Deltik has no idea how to make any of those things yet. This will take a long while... unless... you help! Yes, we can really use your help. No, I'm not asking for donations. If you're a computer programmer who's willing to help with the Log2Log and/or Loguntu project, please, contact us! By kind support by some other developers, I'm setting a tentative date of the end of August 2011 for the launch of an awesome Log2Log Chat Log Converter.